Loggerhead Shrike in Grant County, Washington (photo by Joe Higbee). 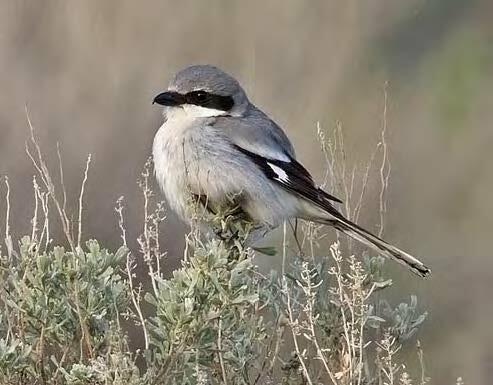 The loggerhead shrike was probably much more abundant in Washington prior to the widespread conversion of shrub-steppe to cropland (Smith et al. 1997). The loggerhead shrike is a small black- masked predator that hunts from perches and sometimes impales its prey on thorns or barbed wire. Shrikes do not possess large feet and talons like raptors, and this habit is an adaptation to eating large prey. Sometimes called ‘butcherbirds’ (the genus name Lanius means ‘butcher’ in Latin), shrikes are the only passerines capable of killing vertebrates by biting the neck and disarticulating neck vertebrae. The species is found in portions of Alberta and Saskatchewan, and throughout much of the U.S. south to southern Mexico (Yosef 1996). Northern populations are migratory, wintering across the southern U. S. and Mexico (Figure 2). In Washington, these shrikes are primarily a breeding resident of the eastside shrub-steppe zone. The Interior Columbia River Basin Ecosystem Management Project listed the loggerhead shrikes as a species of high management concern, which was defined as a species “experiencing long-term population declines, thereby suggesting that current management activities may not be compatible with long-term persistence” (Saab and Rich 1997). Most loggerhead shrikes arrive in Washington mid- to late March and depart on fall migration by September (Poole 1992, Leu and Manuwal 1996, Stepniewski 1999). They are generally rare during winter in eastern Washington (Wahl 2005), but a small number winter on the Hanford Site in Benton County (H. Bowers, unpublished data). A few winter and spring records also exist for western Washington (Wahl 2005). Migration patterns are not well understood, and the wintering areas of birds breeding in Washington are unknown. Loggerhead shrikes are generalists, feeding on any animal they can subdue, including insects, small mammals, birds, reptiles, and amphibians. During the breeding season in Washington, shrikes are largely insectivorous. On the Hanford Site, shrikes preferred grasshoppers, lizards, and small mammals (Poole 1992). On the Yakima Training Center in Yakima County, shrikes’ pursuit of small passerine birds peaked during the April migration, whereas pursuit of grasshoppers increased from 0% in April to nearly 100% in August (Leu and Manuwal 1996). This species is highly territorial and defends larger areas than other insectivorous perching bird species of similar size, with mean territory size ranging from 7.5 to 34 ha (18.5-84 ac) (Yosef 1996). The average distance separating the closest nesting pairs of shrikes was 610 m (2,000 ft) at Hanford (Poole 1992). Of 207 nesting pairs monitored on the Hanford Site, at least 19% renested 1-3 times after nest failures; most pairs produced one brood, but 5% fledged 2 broods in a nesting season (Poole 1992). Predation was the most frequent cause of nest failure, particularly by gopher snakes (Pituophis melanoleucus), black- billed magpies (Pica pica), common ravens (Corvus corax), and coyotes (Canis latrans). Most shrike territories (96%) were re-occupied the 2nd year of the study, suggesting high survival rates of adults or a shortage of nesting sites (Poole 1992). On the Yakima Training Center, Leu and Manuwal (1996) observed that 63.7% of 77 territories were re-occupied the 2nd year. Studies of banded birds elsewhere indicate that while re-occupancy may be high, site fidelity is generally lower (14-41%) (Pruitt 2000). Leu and Manuwal (1996) reported that nest failure from predation was 11.1% in the first year and 36.5% in the 2nd year of their study. Nesting success and fledgling survival were higher in a wetter year. Habitat. Loggerhead shrikes use open habitat with scattered shrubs during both breeding and nonbreeding seasons. In the shrub-steppe of eastern Washington, Poole (1992) found that shrikes nested in shrub-dominated plant communities and were rare or absent in grasslands, riparian zones, and areas dominated by rabbitbrush and cheatgrass. Nesting territories were a mosaic of tall shrubs and openings of grass or sand dune, and were not located in upland sagebrush lacking openings for foraging. Openings dominated by cheatgrass were rarely used. Leu and Manuwal (1996) noted that shrikes most often foraged on bare ground or in sparse ground cover, and avoided areas of continuous cover created by exotic vegetation (e.g., cheatgrass and tumblemustard). Poole (1992) noted that shrikes did not nest in riparian zones or within 500 m of water, possibly to avoid nest predation by magpies and ravens. Shrikes were most abundant in areas of flat topography, deep soils, and patchy vertical structure of taller shrubs, particularly old sagebrush or bitterbrush that had been patchily burned. Consistent with Poole’s (1992) observations, widespread surveys in eastern Washington shrub-steppe detected more loggerhead shrikes in areas with deep, sandy soil than in areas with loamy or shallow soils (Vander Haegen et al. 2000). At Hanford National Monument, shrikes were most abundant in sagebrush/bunchgrass and secondly in sagebrush/cheat cover types, preferring areas with 11-20% sagebrush cover and 25% bare ground (Earnst and Holmes 2012). Bunchgrass and cheatgrass cover types were not used. In eastern Washington, loggerhead shrikes nest most often in big sagebrush and bitterbrush, but occasionally nest in mock orange (Philadelphus lewisii), greasewood (Sarcobatus vermiculatus), clematis (Clematis spp. ), and currant (Ribes spp.) (Poole 1992, Leu and Manuwal 1996). Nesting areas on the Yakima Training Center show varied shrub heights, less cover by exotic grasses and forbs, and taller shrubs than random sites (Leu and Manuwal 1996). Nearly all nests were on ravine flanks with northeast or southeast aspect. Population status. Loggerhead shrikes were surveyed throughout the Columbia Basin in Washington in 1993-1994, with 152 shrike territories observed on 22 road transects (McConnaughey and Dobler 1994). Routes averaged 0.18 territories/km and nests were separated by at least 666 m. The Hanford route had the highest numbers of territories (0.64/km). Poole (1992) reported that shrike densities in the best habitat types on the Hanford Site were 12-19 times higher than was typical elsewhere in eastern Washington. Loggerhead shrikes have exhibited widespread and consistent declines for several decades across most regions of their range (Pruitt 2000). 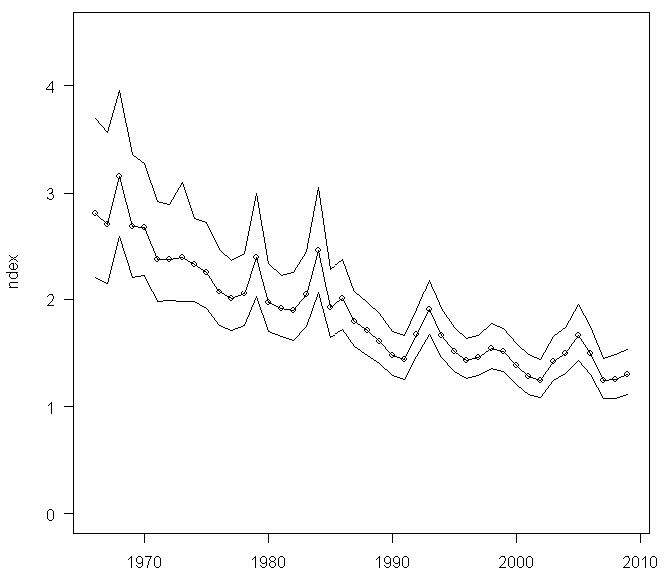 Breeding Bird Survey data for the Columbia River Basin (eastern Washington, eastern Oregon, Idaho, western Montana) showed a significant decline in shrike abundance during 1968-1994 (p<0.10; Saab and Rich 1997). Breeding Bird Survey data for western North America indicated an annual decline of -1.7% from 1966-2009 (Figure 3; Sauer et al. 2011); data for Washington suggest a -3.4%/year decline for the period, but the smaller sample size makes this conclusion less reliable. Some of the decline in the northeastern and Great Lakes states represents a retraction with the regrowth of forest; shrikes likely expanded their range into these regions with the clearing of forest for agriculture in the 19th century (Cade and Woods 1997). However, continued declines and disappearance from areas with suitable habitat have not been explained. Factors affecting populations. Suggested causes of population declines include loss of breeding habitat, low overwinter survival due to loss of wintering areas, high mortality rates from vehicle collisions, and exposure to pesticides (Pruitt 2000). Loss of shrub-steppe habitat, particularly on flat areas with deep soil, probably is the most important factor in the historical declines of the species in Washington (Poole 1992, Smith et al. 1997, Vander Haegen et al. 2000), but other factors may be involved. Declining patch size, fragmentation, wildfires that eliminate shrubs, and degradation by cheatgrass and other invasive plants all affect shrike habitat (Pruitt 2000). Loggerhead shrikes appear susceptible to accumulation of some pesticides, although the exact impacts on populations have not been determined (Pruitt 2000). Ingestion of pesticide-laden prey can lead to toxic effects on adults and in eggs, and pesticide applications can significantly reduce the local availability of insects, especially grasshoppers. The organochlorine, DDT, is known to have caused eggshell thinning in raptors and reduced reproductive success in some species. However, shrike eggshells collected in California and Florida before and after the introduction of DDT showed no significant thinning (Morrison 1979). Clutch and brood sizes declined after the introduction of organochlorines, possibly because of reduced food supply (Yosef 1996). Sharp declines of loggerhead shrikes in the Great Plains corresponded to dieldrin treatment of grasshoppers (Yosef 1996). In one Florida study, 15% of shrikes had bill or foot deformities that may have been related to pesticide exposure. Collisions with vehicles are another important concern (Pruitt 2000) and probably result from the species’ habits of hunting along roadways, where perches are sometimes plentiful, and flying low over the ground. Conservation. The U.S. Fish and Wildlife Service conducted a rangewide status assessment of the loggerhead shrike and summarized information from each of the states and Canada (Pruitt 2000). No recent activities specific to loggerhead shrikes are currently underway in Washington, but several efforts to protect and restore shrub-steppe habitat will benefit the species. Altman, B. and A. Holmes. 2000. Conservation strategy for landbirds in the Columbia Plateau of eastern Oregon and Washington. Final Report Version 1.0. Oregon-Washington Partners in Flight, Boring, Oregon. Brooks, B. L., and S. A. Temple. 1990a. Habitat availability and suitability for loggerhead shrikes in the upper Midwest. American Midland Naturalist 123:75-83. Brooks, B. L., and S. A. Temple. 1990b. Dynamics of a loggerhead shrike population in Minnesota. Wilson Bulletin 102:441-450. Cade, T. J. and C. P. Woods. 1997. Changes in distribution and abundance of the loggerhead shrike. Conservation Biology 11:21-31. Earnst, S. L. and A. L. Holmes. 2012. Bird–habitat relationships in Interior Columbia Basin shrubsteppe. Condor 114:15-29. Leu, M. and D. A. Manuwal. 1996. Habitat requirements, status, and management of the loggerhead shrike of the Yakima Training Center. Final Report, College of Forest Resources, University of Washington, Seattle, Washington. McConnughey, J. and F. C. Dobler. 1994. Project shrike: abundance and perch use of loggerhead shrike in eastern Washington, 1994. Washington Department of Fish and Wildlife, Region 2, Ephrata, Washington. 59 pp. Morrison, M. L. 1979. Loggerhead shrike eggshell thickness in California and Florida. Wilson Bulletin 91:468-469. Poole, L. D. 1992. Reproductive success and nesting habitat of loggerhead shrikes in shrub-steppe communities. M.S. thesis, Oregon State University, Corvallis, Oregon. Pruitt, L. 2000. Loggerhead shrike status assessment. U. S. Fish and Wildlife Service, Bloomington, Indiana. 169 pp. Saab, V. A. and T. Rich. 1997. Large-scale conservation assessment for neotropical migratory landbirds in the Interior Columbia River Basin. USDA Forest Service General Technical Report PNW-GTR-399. Sauer, J. R., J. E. Hines, J. E. Fallon, K. L. Pardieck, D. J. Ziolkowski, Jr., and W. A. Link. 2011. The North American Breeding Bird Survey, Results and Analysis 1966 - 2009. Version 3.23.2011 USGS Patuxent Wildlife Research Center, Laurel, Maryland. Smith, M. R., P. W. Mattocks, Jr., and K. M. Cassidy. 1997. Breeding birds of Washington state. Volume 4 in K. M. Cassidy, C. E. Grue, M. R. Smith, and K. M. Dvornich, editors. Washington GAP Analysis – Final Report, Seattle Audubon Society Publication in Zoology Number 1, Seattle, Washington. Stepniewski, A. 1999. The Birds of Yakima County, Washington. Distributed by Yakima Audubon Society, Yakima, Washington. 278 pp. Vander Haegen, W. M., F. C. Dobler, and D. J. Pierce. 2000. Shrubsteppe bird response to habitat and landscape variables in eastern Washington, USA. Conservation Biology 14:1145-1160. Wahl, T. R. 2005. Loggerhead shrike. Pages 254-255, in T. R. Wahl, B. Tweit, and S. G. Mlodinow, editors. Birds of Washington: status and distribution. Oregon State University Press, Corvallis, Oregon. Wiggins, D. 2005. Loggerhead shrike (Lanius ludovicianus): a technical conservation assessment. Rocky Mountain Region, USDA Forest Service, Golden, Colorado. Yosef, R. 1996. Loggerhead shrike (Lanius ludovicianus). Number 231 in A. Poole and F. Gill, editors. The Birds of North America. Academy of National Science and American Ornithologists’ Union, Philadelphia, Pennsylvania.